Black Hills State University Students stop to take pictures with Governor Bill Weld in front of the Jonas Science building before his speech in Club Buzz Oct. 20. One hundred students, faculty, and members of the community gathered inside Club Buzz at Black Hills State University to hear former Massachusetts governor and Libertarian vice presidential candidate Bill Weld speak Oct. 20. Weld spoke to the crowd about the policies of his and Governor Gary Johnson’s campaign and took questions from the crowd on the issues that have been a hot topic this campaign season. BHSU students were excited to see Weld speak. Many of them showed up in “Johnson/Weld 2016” t-shirts and pins and a few got the chance to pose for pictures with the vice presidential candidate before the event. Alexis Ellison, a sophomore majoring in psychology and sociology, wanted to get more information about Weld and the Libertarian Party. Rishell Lizasuain, a junior majoring in secondary education and social science, enjoyed Weld’s positive attitude. “I think that hearing what he had to say was nice. He not only has his own beliefs, he doesn’t have to put the other candidates down to get a one-up,” Lizasuain said. Both believed that Weld’s presence on campus helped sway more young voters to vote third-party. “It’s an appreciation for us as students. We’re not the biggest school in the state, but to make the effort to come see us and trying to get smaller schools involved is a good thing,” Lizasuain said. Weld also made an appearance in Rapid City Oct. 21 to speak with local business leaders. 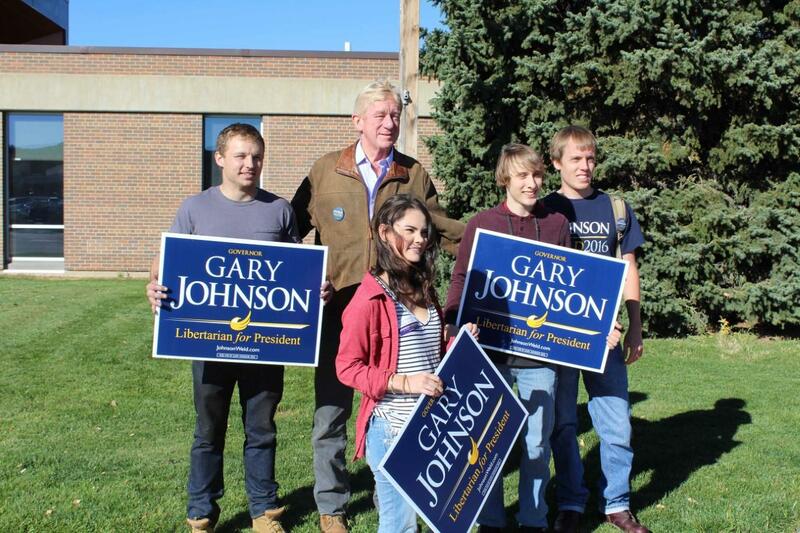 Johnson also made an appearance in Rapid City Oct. 26 at the Rushmore Plaza Civic Center.